I was intrigued when I heard about Red Bean Jelly as I have never thought about the making it into jelly before. Red Bean has always been on the heavy side for me when it comes to dessert as it’s usually very rich and sweet. While as for jelly, I always depict it as light and refreshing, perfect dessert choice after a heavy meal. 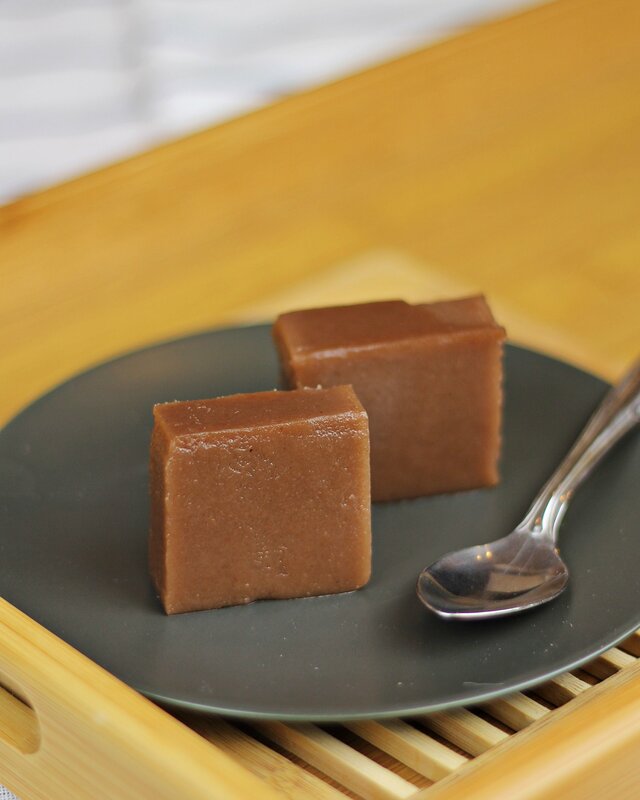 When I got to try out Mizu Yokan (Red Bean Jelly) in Japan, I was amazed! The flavor of the red bean was strong, yet it was still refreshing. I was told that the Japanese love their jelly during the summer. Apparently, there are a few different variations of Yokan in Japan. 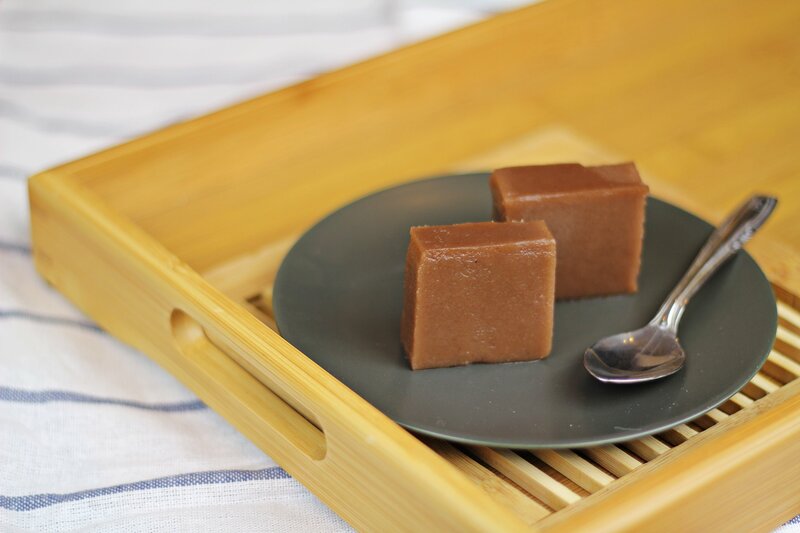 Some would make the jelly with strained red bean paste (like I do here) to give a smoother texture, while some would add in whole soft-boiled chestnuts or use unstrained red bean paste to give texture to the jelly. My experience staying at a traditional Ryokan was amazing. Make sure to check out my travel vlog where I got to try out being in the hot spring and Japanese traditional multi-course dinner, Kaiseki. This was also where I got to try out the traditional dessert, Mizu Yokan for the first time. I just had to recreate the dessert for you guys! I couldn’t find Japanese red bean paste in Singapore, so I made it using local red bean paste that was pre-made ready for Chinese bao. Indeed, the type of paste you use here will determine the color of your jelly. I believe you will get a darker and less opaque end result if you use Japanese red bean paste. As there was higher oil content in my local red bean paste, my jelly a little different. I would highly recommend you guys to find Japanese paste for this recipe if you can. I did have to make some adjustment to the recipe to perfect it as I feel I don’t like my jelly to be too rich and too sweet. But, feel free to actually change it up to your liking! The recipe is actually very versatile. If you like your jelly to be firmer, just add a little more agar agar powder. Omit the extra sugar if you think it is too sweet. For me, it’s perfect. In a saucepan, combine water, sugar and agar agar powder. Bring it to a boil to dissolve the agar agar powder completely. Stir in red bean paste and keep mixing until the paste have melted completely. Sift through a strainer to ensure the mixture is smooth. Transfer into a container or a square mold. Let it cool down to room temperature before chilling it in the fridge for at least 4 to 5 hours. Un-mold the jelly and slice them into bite size pieces. Serve chilled with Japanese green tea. Adjust the ingredients according to your preference. Add in canned chestnuts or use paste with red bean skin on if you prefer. 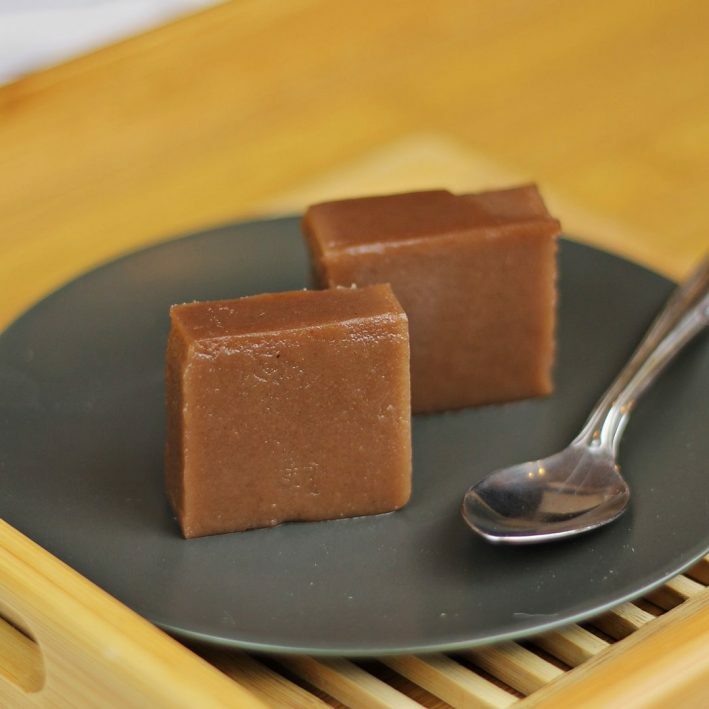 This entry was posted in All Recipes, Sweet Treats and tagged Japan, Japanese, jelly, Mizu Yokan, Red Bean, Red Bean Jelly on March 20, 2018 by Zong Han Chua.